You can select a variety of layout options for your document or photo by selecting Layout from the pop-up menu on the print window. To print multiple pages on one sheet of paper, select the number of pages in the Pages per Sheet pop-up menu. 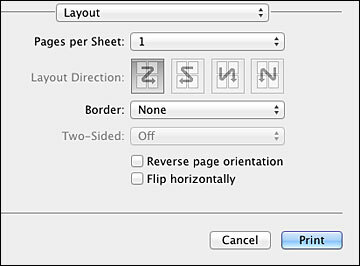 To arrange the print order of the pages, select a Layout Direction setting. To print borders around each page on the sheet, select a line setting from the Border pop-up menu. To invert or flip the printed image, select the Reverse page orientation or Flip horizontally settings.